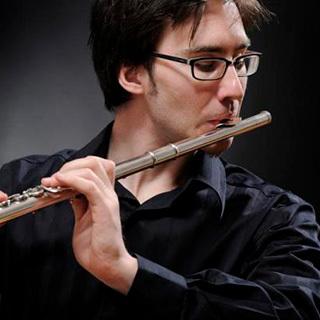 London-based Slovenian flautist Boris Bizjak graduated from the Ecole Normale de Musique de Paris “Alfred Cortot”, where he obtained the “Diplôme Supérieur de Concertiste” guided by renowned French flautist Pierre Yves Artaud. Boris is a winner of international and national flute competitions. His prizes include the 1st prize of the International Flute Competition in Picardie (France), the 1st prize of the Slovenian National Flute Competition and the two 1st prizes of the Slovenian National Chamber Music Competition. Boris was granted a number of concerts by Slovenian association for Young Musicians as well as the scholarship for postgraduate studies abroad by the Slovenian Ministry of Culture. He has performed as a soloist and chamber musician in Slovenia, UK, USA, France, Italy, Germany, Austria, Cyprus, Croatia, Serbia, The Netherlands, Japan and China in halls such as the Beijing Concert Hall, Konzerthaus Berlin, Lisinski Concert Hall in Zagreb, Slovenian Philharmonic Hall, Gallus Hall in Cankarjev Dom, St John Smith Square and St Martin-in-the-fields. Boris has appeared as a soloist with the Chamber Orchestra of Slovenian Philharmonic under Dimitry Sitkovetsky, City of London Chamber Orchestra, London Euphonia Orchestra, Symphony Orchestra of the National Theatre Maribor under Milivoj Šurbek, Solisti Divini and the London Brandenburg Soloists. His first CD release with flutist Marko Zupan and pianist Yoko Misumi, “Music for two Flutes and Piano” features a world premiere recording of Duet in C minor by Johannes Frederik Frohlich and a new arrangement for two flutes of W. A. Mozart’s Sonata for two pianos in D Major K. 448 / 375a. Recently he recorded a CD with pianist Maria Canyigueral. Boris is a founder of Hedone Records; in 2016 he has been awarded a Silver Medal at the Global Music Awards as a sound engineer for the CD by violinist Lana Trotovšek and pianist Maria Canyigueral. He is also the cofounder of Blackheath International Chamber Music Festival and a founder of the London Brandenburg Soloists, where he plays the baroque flute. Before moving to London, from 1999-2003 and 2007-2011, Boris was a teacher in a junior state music school in Slovenia for 6-18 years of old . He gave masterclasses in Slovenia, Cyprus and most recently in Japan, where he has been returning for performances and masterclasses every year from 2015.